Make naturally-delicious beverages containing organic ingredients with this Monin 750 mL organic vanilla flavoring syrup! This syrup is sweetened with organic cane sugar and does not include additives or preservatives. Add a splash of this vanilla syrup to your fresh-brewed coffees and teas and it's sure to please your guests. Blend it with milk or cream to make lattes, mochas, shakes, or use it to create signature cocktails. Featuring the popular taste of vanilla beans, this syrup will enhance the flavor profile of your drinks without overpowering them or being too sweet. Packaged in a glass bottle, this organic flavoring syrup makes an excellent addition to any restaurant, bar, coffee shop, or cafe. It boasts a sleek appearance for an attractive shelf presence and can easily be paired with a compatible pump for quick, efficient service during peak serving hours. Since 1912, Monin has had a passion for delivering premium products that simplify the beverage-making process. Their sense of innovation and creativity has led to a wide variety of flavors and recipes to suit any menu. 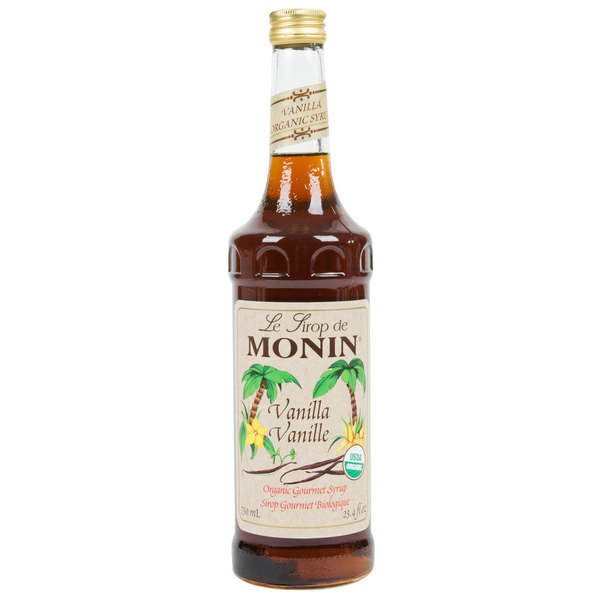 Use this Monin organic vanilla syrup to craft superior beverages for your guests! I have to again say that you have the best prices and the most selection when it comes to this Monin flavoring. Thank you for your excellent pricing. The organic vanilla syrup is perfect for creating wonderful beverages. I love organic items and feel great serving them to my family and customers. A great, strong vanilla taste. An awesome organic vanilla flavoring syrup that is a new hit with our bagel shop. Great for our organic coffee and makes a great tasting coffee. Wow is all I can say. This Monin syrup is absolutely fantastic. In my opinion it is a little bit strong but that is fine with us. We just use a max of 1 and a half or 2 with our drinks. It is definitely one of their better ones. The organic vanilla syrup is a new syrup for us. We love the quality and taste. A perfect flavor and classic for making all types of drinks. The organic vanilla flavoring syrup has a wonderful flavor. it is more pricey than the regular and the taste difference is not there. Still makes a great coffee syrup. i had no idea that they offered organic vanilla. I tried this stuff the other day and it was really delicious. I will definitely be buying it again. Thrilled to have an organic vanilla syrup for my coffee now. I have hunted high and low and am very satisfied with the flavor and quality of this one. A really nice organic style vanilla syrup that is perfect for our vegan café. The syrup is sweet and rich and very tasty. A very popular add in syrup with our coffee. OMG! I can not believe I found an organic vanilla flavoring syrup that tastes so great and at an amazing price. I love finding organic items because they are so much better for you. I love the great vanilla taste and it goes great in my iced coffee. I love organic series of Monin syrup! it is made by organic cane sugar and I like how it does not taste artificial like other brand. Great price for organic product. Recommended! I hate to admit I'm still not sold on the whole organic bandwagon. The syrup was more expensive than the regular vanilla syrup I buy and not as flavorful. I feel as if I am paying more for a not as superior product. The vanilla flavor was ok but not as rich and creamy as I would have hoped. My customers were not as crazy about this I thought they would be. I've tried over 25 Monin Syrups and this Organic Vanilla is in my top 3. The smell is to die for and it tastes even better. You can use this flavor in sooo many ways but it is great in coffee, over ice or even to add a hint of vanilla flavor in a dish. This is a flavor that will not dissapoint. 5 STARS!!! This vanilla will make your coffee taste professionally made! It's both natural and organic, and it's not too sweet, meaning it's a great way to get your sweet tooth on! This one has a good vanilla flavor. it's good on it's own or when paired with numerous other flavors. It can be used anyhow and anytime you want to add that sweet vanilla taste. My favorite. Very good in strong coffee with or without milk and sugar. Not artificial tasting. No aftertaste. Will buy again. Makes coffee a special indulgence. A true vanilla flavor! I use this in coffee and it's absolutely delicious. It's even better knowing that it's organic. A great product for a great price.